The 2014 BC Provincial Cup got underway this past weekend with eight preliminary round matches kicking off the newly expanded B Cup. With 29 goals, and a few red cards along the way, it was an entertaining start to this year’s competition. The action kicked off on Friday night when defending Champions, and Richmond League and Cup double winners, Richmond All Blacks took on Burnaby side Mundiavocat. The All Blacks were heavy favourites and despite being reduced to ten men for an intentional handball in the 15th minute, went in at the half 5-1 up. It looked all over but, full credit to Mundiavocat who made a real fight of it in the second half and pulled a couple of goals back but couldn’t close the deficit. 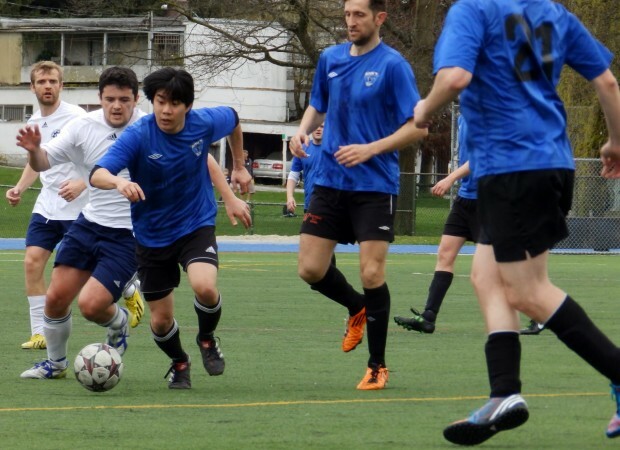 AFTN’s featured match of the round took place at Point Grey High School and was an all VMSL clash between home side Rino’s Fury and Bombastic FC. There was little to choose between the teams going into the tie and so it also proved when the action got underway. Rino’s had just missed out on winning the Division 2A title by a point, whilst Bombastic had finished runners up in Division 2B. 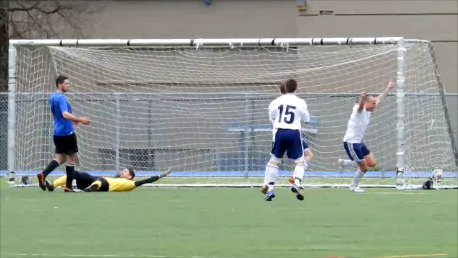 It was a fairly even opening, with the best chance coming 11 minutes in when Jon St Jean forced a good save from Rino’s keeper Patrick Hayward after a turn and strong shot in the box. Both sides had chances that they couldn’t convert as the half went on. Bombastic came closest with a shot that went inches past the left hand post in the 20th minute, with the home side’s best chance falling to Ian Solven 15 minutes later, but his shot was saved by Adam Guthridge after he showed some nice footwork in the box to make a chance from a flicked on free kick. As the half ticked to a close both sides should have taken the lead, with a squandered Rino’s chance followed in stoppage time when Fury’s keeper Hayward did well to keep out a Jordan Roberts shot after he was played in unmarked 12 yards out. Bombastic FC had looked the slightly better team in the first half and as the second went on they were increasingly looking like the team that was going to open the scoring. They did just that three minutes from the hour mark when a lobbed ball into the box was poorly dealt with by David Gazin, heading the ball off the back of his head and straight into the path of Pat Blennerhassett and he made no mistake of knocking the ball home from a few yards out for the opening goal. The Fury hadn’t been able to muster much of an attack in the second half but conceding the goal reinvigorated them a little bit and they enjoyed more forays forward but couldn’t capitalise on them. With 18 minutes remaining, a Rino’s handball in the box saw the referee point to the spot and Luke Dorn made no mistake in firing home past Hayward. The home side were now left chasing the game and turned up the pressure. Guthridge produced a stop to keep out Travis Sanders with three minutes remaining and with no breakthrough coming, Rino’s day got worse in the final seconds of stoppage time when Brent Hanson picked up his second booking of the afternoon and a red card. Bombastic FC ran out pretty comfortable 2-0 winners in the end and now head to Burnaby to take on Europa FC in the first round proper. Europa finished 5th in the BMSA this season but won the Rudolph Cup at the end of March. Photos from the game can be seen on our Flickr account. The first round proper of the B Cup gets underway next weekend, along with the first games in the A Cup, Masters and U21s. There’s some tasty A Cup matches in store. With the top two VMSL sides, West Van and CCBRT United, clashing at Ambleside at 7.30pm on Friday. There’s also a top two FVSL match up between Port Moody Lordco Gunners and Langley United and an Imperial Cup rematch between Inter FC and Columbus FC to keep you entertained. With a number of cracking games lined up, and with the Whitecaps being away in LA, it’s a great chance for people to get out and #SupportLocalSoccer. You can find full details, venues and times of all the games over on BC Soccer’s site. AFTN will once again be bringing you extensive coverage of this year’s Provincials and we’re hoping to take in a number of A and B Cup games this coming weekend. If anyone is interested in covering some of the games on the island or matches in the Masters, U21s or women’s competitions then get in touch! We don’t need full reports, just a very brief rundown of what played out.